POLYTHERM®, the exclusive double coating by Metaltex that adds value and quality to the product. From our Metaltex Research & Development department a unique double coating has been created with the aim of adding extra protection to wire products. This one of a kind coating process, Made in Italy, adds a second transparent protection layer right after a first metal-coloured layer, making it incomparable with traditional single coating treatments, such as low density polyethylene and epoxy. Polytherm® works as an anti-rust treatment: it’s unique transparent protection helps to prevent rust, and is shock resistant – considerably prolonging the product’s life. Polytherm® adds value to the product: the antistatic transparent protection does not attract dust, making products much easier to clean, resulting in attractive and shiny products at the POS. 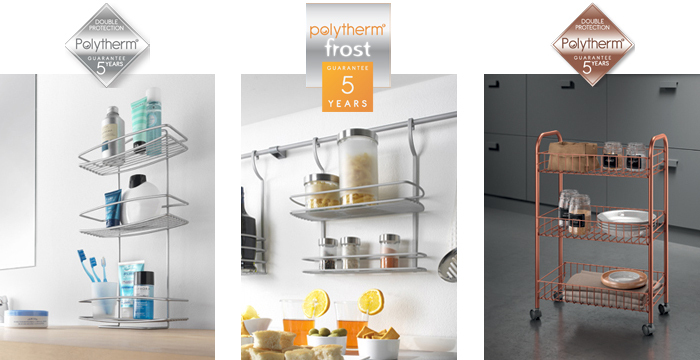 Polytherm® products come with a 5 year guarantee. The original treatment in a classic silver metallic look. A refined colour that would like great in any room of the house. The state of the art anodized aluminium look. An avant-garde silver matt colour, smooth to the touch, with a particularly vibrant, almost glowing, matte finish. The copper finish is a beautiful modern/traditional combination. Designers, furniture experts and bloggers, all over the world, are very enthusiastic about this bronze-metallic colour, which brings elegance and warmth into the home.